Just like paid advertising, circulation is continuing to drop at The Kansas City Star. According to the Alliance for Audited Media, a nonprofit organization consisting of newspaper and periodical publishers, The Star’s average Sunday circulation for the quarter ending last September was 182,780. Two years earlier, average Sunday circulation was 242,583. That’s a drop of almost 25 percent. It was even worse for average Monday-Saturday circulation. For the quarter ending September 2014, that figure was 164,053. Over the ensuing two years, it plummeted to 117,734 — a 28 percent drop. Those numbers include print and digital subscriptions, so it’s clear that The Star’s push to increase digital circulation is not offsetting the ongoing decline of print subscribers. The Star, of course, is not alone in this cascade. Other major metropolitan dailies have seen double-digit-percentage circulation losses in recent years. For example, the St. Louis Post-Dispatch’s average Monday-Saturday circulation fell nearly 33 percent between September 2014 and September 2016. The raw numbers were 169,252 (2014) and 113,990 (2016). The P-D’s Sunday circulation didn’t tumble as severely as The Star’s: It was down just 16 percent — from 459,072 in 2014 to 385,690 in 2016. What does this mean for the future of The Star, the Post-Dispatch and other major metropolitan dailies? Despite appearances, it’s very hard to say, and indications are it is way too early to consign print papers to history. The prevailing view of many publishers is, “We’ve gotta move people over to digital so we can increase advertising revenue there.” A contrary school of thought, however, holds that print will not easily be unseated as the go-to medium for a majority of news consumers. An article last year in the Columbia Journalism Review said although the number of people who read print newspapers has dropped 50 percent in the last 20 years, the Pew Research Center reported that print-only is still the most common way of reading news, with more than half of readers in 2015 opting for the print product over digital. The author of the article, Michael Rosenwald, a reporter at the Washington Post, cited the work of a University of Texas researcher who had found in a survey of news readers 18 to 24 years old that 20 percent had read the print edition of a newspaper during the week they were surveyed, while less than 8 percent read it digitally. In two other hopeful signs for print products, Rosenwald said the sale of printed books has risen every year since 2013, and surveys have shown that university students prefer printed textbooks over electronic ones. The vast majority of newspapers’ revenue still comes from their print publications, partly because online ad revenue is significantly diluted by Google and ad auction companies taking their piece of sales. A British paper, The Guardian, bought ads on its own website to see how much money it netted after the middle men got their share, and it was 30 cents on the dollar! That reminded me of something The Star’s new editorial board vice president, Colleen McCain Nelson, said last month at her first public appearance since starting work in December. 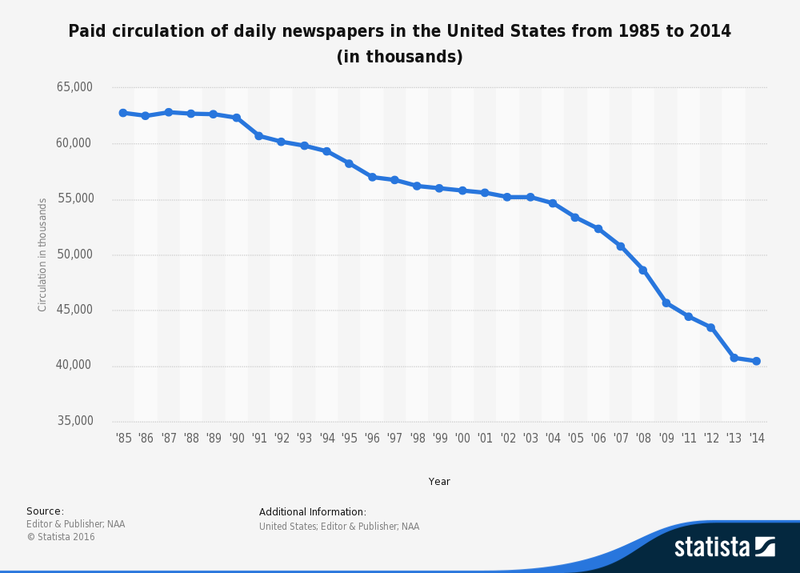 While these big circulation dips are alarming, then, to those of us — the many of us — who treasure our print newspapers, it may be a long time before we have to start thinking about the print product getting the Last Rites. Love print; it’s why I have The New York Times delivered (with electronic access a lovely bonus feature.) And I agree with Nelson — a good paper gently guides you through its pages. The Star hasn’t had heart in years. There will always be a place for ink on paper. It’s both an intellectual and visceral experience. They key to luring people to pick it up is content. It is king. Huzzahs to both gentlemen. Content is king. For example, I just read online from Joco gummint, that they are deliberately planning to skirt the law and raise property taxes before our STATE elected official mandate (like Prop 13) that if you want to go higher than the formula matched to economic growth, there must be a VOTE of the PEOPLE. But our arrogant Ed Eilert, (King of King Louie, our $32 million Palace of Nothingness that bailed out his real estate buddies) is making an end run. The Joco Board of County Commissioners just moved up their budget hearings by one month. They are clearly going to hike property taxes before the state law goes into effect! With no one really alerted, they have 4 of 7 votes already in their pocket, and will jam that through. Despite two tax hikes LAST year! Now of course, back in the day, Finn Bullers and Jim Sullinger would have both reported this. And been given news hole for a decent story of such. But will Steve Vockrodt be afforded that news hole? I doubt it. He’s the STAR’s new Dan Margolies, utility infielder, assigned to all great stories. And meanwhile, he labors on the Three Paragraph Business Desk. Waiting for a break on the Schlitterbahn scandal–hoping SOMEONE has the balls to sue the Unified Government for their Gang of Five Goofballs who invented the hoop and net contraption that was the noose that strangled young Caleb Schwab. Until the STAR actually COVERS the news, there is no point to read it in any format. Period. Paragraph. I don’t think that would be in Vockrodt’s bailiwick, Tracy. As you suggested, he is assigned primarily to business-related stories. Problem is, as you also say, no one apparently is assigned to cover JoCo “gummint” so it floats along on its own. It’s too bad they’re stretched so thin, but, as I’ve pointed out, the news hole has gotten progressively bigger after reaching a pathetic low under Mi-Ai a couple of years ago, and they’ve hired several young reporters and, of course, muscled up the editorial page. It’s definitely on the upswing, but it’s frustrating to people like you and me and Will and Keenan, who know what a really good major metro daily should look like (we used to have it right here in River City), and it just won’t hit that level again, at least in our lifetimes…Maybe in Vockrodt’s! Yeah, don’t be a stranger, Tracy! Always informative and entertaining. Not true, Fitz. Vockrodt has now been assigned to the JOCO desk. I pointed that out to you a column, or two ago. I believe The Star announced it, or perhaps Steve did on Twitter. Professional news: I’m adding Johnson County politics to my repertoire. It’s my job to find stories, but if you know something, hit me up. There is content, and I echo the comments already made. And there is delivery — a part of the subscription formula for which the Star has struggled to the point of incompetence. I’m one of those addicted to the daily paper, but the Star’s subscription services and delivery have declined to the point where you can’t even get to the point of evaluating content. Mystical rates, impossible customer (dis)service, and random/poor delivery make having a paper delivered a significant burden. Promises have been made, but until the Star figures out its customer service, content will be irrelevant. Mystical rates…Love the term. Just about everyone who talks to me about their negotiations with The Star’s overseas call-takers about rates has a different story, with widely swinging prices being quoted. That’s not good because word gets around and people then think, even when quoted a favorable rate, they’re getting taken because they heard somebody else got it at an even lower rate. They need to set a price and stick with it. It’s OK to have special, start-up rates for, say, six months, but the variable-rate system is self-defeating. I think part of the reason they’ve done that is they know the product hasn’t been up to par. But now that it’s getting better, they need to dump price flexibility. But Fitz–if they stuck to one rate, what would they do with all those free umbrellas at local street fairs??? I hate that newspaper circulation has plummeted to such worrisome levels and the survival of robust, fearless and experienced news gatherers is in question, but I can’t escape the Schadenfreude I feel for the publishing bigwigs (plenty of whom filled the executive offices at 18th and Grand) who have proved their ineptitude in the face of crisis. When heartless monopoly practices were routinely enforced so that scandalously high profits could be achieved with little effort, they acted as if they were business geniuses whose savvy management created profit machines. Now it is clear that they were just riding the waves and when called upon to steer the boat to safety, had no idea how to do it–except to throw most of their crew members overboard. Eloquently and forcefully stated, Mike…Many people, including many who have never worked there, have the same assessment — the boat, now pretty flimsy, is rocking perilously in the waves. John — Thanks for the update on Steve’s JoCo assignment. I missed it. That’s a positive step. Or you could wait till it warms up, and have a street fair, with a Dunk Tank. Too bad Jason Whitlock is gone. When he would have hit the water in his XXXXL Speedo, it would have created a tsunami. Oh, thanks. An image I can’t unimagine. Hmmmm, we may have to bring Yael back. At least he had the good sense not to criticize KU basketball. I loved that editorial today…I’ve never seen anything like it. Bravo to Colleen and whoever wrote it! A sacred cow skewered. Easy for you to say, Mizzou could replace most of its players with women from the volley ball team and win more games. Listenin’ to the guitars ring. “I’ll be damned.When was that?” I hadn’t heard a thing. And thereby own a piece of the legend. With the cow herd all dispersed the old cavvy she had to go. Back in August–100 head and more. So come on boy, run ’em in. We’re gonna let this sale begin. Last of the big remudas of the mightly M.C. There’s horses here for everyone. Saddle ’em kids let’s get her done. This outfit’s history–this outfit’s history. And the people all gathered ’round. One ol’ boy gave two grand for Banjo. Back in August– 100 head and more. Say hi to Chuck and Annie. They’ll show you them big ol’ steer heads up there hangin’. When you ask where have they gone? Way out on the sagebrush sea.